The weather has been great for the last couple of days. It is highly appreciated. We have professor wearing a halter now!. He has bad breath we realized last night... ohh llama-breath..yuk. 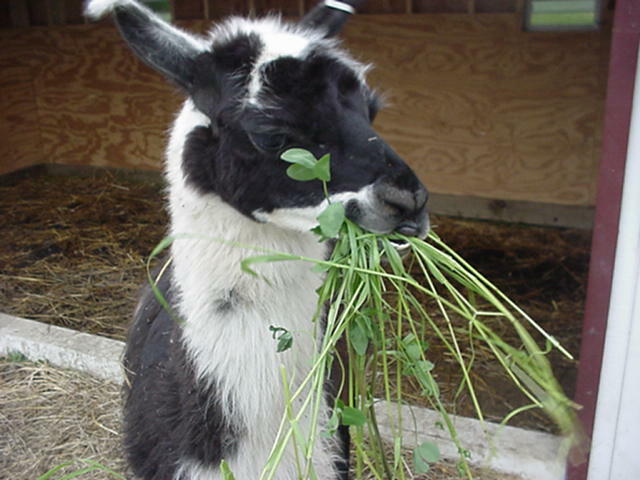 The picture below shows Artemis eating some dessert grasses that Susan Spear donated to the llamas. Artemis (not normally a big eater) grabed a big bunch and did a grunt to indicate his pleasure and dominion over the grass. Tioga is our big barn cat that keep the critters under control.